Viedtech offers a full range of Residential Survey CAD drafting services. We specialize in helping clients with survey drafting services ranging from a small lot to subdivision and to residential sites of any size. We are a reliable and affordable RESIDENTIAL SURVEY CAD DRAFTING SERVICES company and look forward to partnering with you to INCREASE EFFICIENCY & PROFITABILITY of your business. We always employs the best draftsmen, and CAD engineers after thoroughly screening them for their skills, professionalism and dedication. Our technical team is comprised of experienced & knowledgeable personnel to understand and implement ideas and proficient in using state of the art technologies and software tools to produce detailed and high quality outputs. All of our projects are designed to comply with regulatory requirements of the County, State and approving agencies. Our in-house Quality Assurance procedures ensure all drawing packages are competently checked prior to delivery. A boundary survey indicates the extent of any easements or encroachments and may show the limitations imposed on the property. A Topographic survey is a survey that configures the Natural and artificial features (trees, fences, building foot prints, roads, fences) and elevations of the land. A topographic survey shows the location, size, and height of the feature as well as gradual changes or contours in elevation. 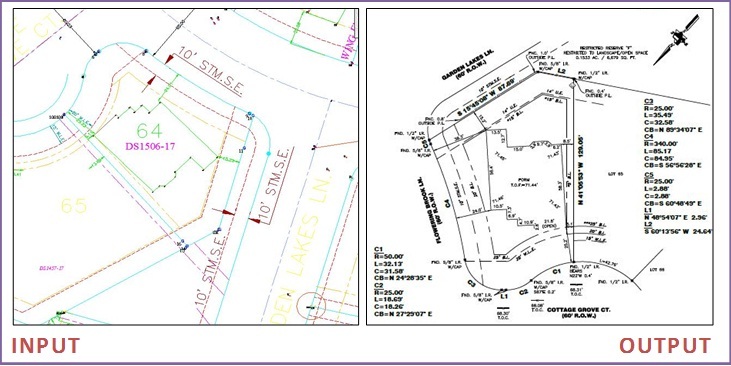 A Lot Survey provides all corners and property lines of the subject property. It gives assurance of the property represented by the seller to the lender and buyer. A Plot Plan shows the buildings, position of roads, utility runs and other constructions of an existing or proposed project site at a defined scale. Plot plan provides the lot dimensions to put the improvements on the lot, the setback lines and easements. A Mortgage survey is the most widely used survey that would be required on a piece of property which is required for purchase. A physical inspection generally focuses on the condition of the building; a mortgage survey investigates the property itself. Most of the financing companies would require a valid mortgage survey for purchase of the property by the buyer. The cost of survey may be covered by most. Final Survey – A survey performed upon completion of a new construction or extension to show and verify the improvements on a property. A final survey is a required item for: Department of Buildings in the process of getting a Certificate of Occupancy. Our fast turnaround, high quality design work, competitive pricing, state of the art customer service and a passion to deliver uncompromising performance that would always uphold the purpose of our inception make us an ideal partner of choice. So, thinking of lowering your operating costs and improving your bottom line. Viedtech makes it possible. We know the secret to scalable CAD production and are successfully serving Clients across USA & Canada. We’re so confident in our abilities to serve you seamlessly and cost-effectively, that we’re inviting you to try us for a complimentary project.